• Could Scalia's Replacement Really Be Held Up until 2017? • Could Obama Make a Recess Appointment to Replace Scalia? As if this presidential race weren't complicated enough, Supreme Court Justice Antonin Scalia died yesterday in Texas at 79. Scalia was nominated by Ronald Reagan in 1986, and was the intellectual and spiritual leader of the Court's conservatives. His death is going to complicate the race in unforeseen ways. To start with, President Obama has to decide what kind of replacement he wants to choose. If he picks a moderate conservative, he might get it through the Senate but at the cost of alienating much of the Democratic Party. If he picks a liberal, it will be bottled up in the Senate Judiciary Committee and never even come to a vote. However, if Obama does nominate a clean-as-a-whistle legal giant and Majority Leader Mitch McConnell won't even allow a vote, the Democrats will quite correctly say the Republicans are playing politics with justice. It didn't take more than a couple of hours for McConnell to say that he thinks the new President should make the appointment to replace Scalia. This means Obama could name McConnell himself to the Court and McConnell wouldn't let it come to a vote. As a consequence, Obama doesn't really have to compromise and name a moderate since McConnell is going to take his chances on getting a Republican President. Also, from his point of view, a Clinton or Sanders appointment wouldn't be much different from an Obama appointment. This means Obama is free to play the whole thing for the politics knowing it doesn't actually matter who he nominates. Reporters and debate moderators are surely going to ask candidates for the type of nominee they prefer. Most likely, Republican candidates will say something like: "I would like a Scalia clone who is about 30." Democrats are more likely to name one of the four justices appointed by Democrats or perhaps justices who previously served. The questioning already started at last night's debate, but will go on for a long time. If a Democrat wins the White House and the Democrats take back the Senate by a small majority, under current rules, the Republicans could filibuster the nominee. It is doubtful that Sen. Chuck Schumer (D-NY), the expected Democratic leader in the Senate, would allow the seat to remain vacant for 4 years. Schumer could either abolish the filibuster altogether, or at the very least, change the rules and require a Mister-Smith-Goes-to-Washington type filibuster, keeping the Senate in session continuously until every Republican senator has dropped on the floor of the Senate and has been carted back to his or her seat. The stakes couldn't be higher here and everyone knows it. If a Democratic President can replace Scalia with a young Ruth Ginsburg, the Democratic appointees would have a clear majority on all cases, with or without Anthony Kennedy. The Democrats would love for such a Court to revisit Citizens United, the Voting Rights Act, and quite a few other cases. In addition to all the complications for the candidates, the Court itself has a problem. A number of controversial cases are before the Court right now. They could easily end up 4-4, in which case the lower court ruling holds and no national precedent is made. The election of a Democratic President and confirmation of Scalia's successor could have a domino effect. Ruth Ginsburg has had cancer twice. She may or may not survive for 4 years, but would probably step down as soon as it was clear the President could get his or her nominees through. Stephen Breyer has long wanted to retire. Thus a Democratic President might get to make three choices early on. No doubt Sen. Bernie Sanders (I-VT) and Hillary Clinton are already scrounging around for names to throw out when asked—probably today. Could Scalia's Replacement Really Be Held Up until 2017? Antonin Scalia hasn't even been buried and already the factions are strategizing for the battle that lays ahead. President Obama said that he will fulfill his "constitutional obligation to appoint a successor—in due time." Republican leaders declared that it would be inappropriate for Obama, in his last year in office, to presume to do so. "The American people should have a voice in the selection of their next Supreme Court Justice," said Senate Majority Leader Mitch McConnell (R-KY), while Senate Judiciary Committee Chair Chuck Grassley (R-IA) insisted that, "The fact of the matter is that it's been standard practice over the last nearly 80 years that Supreme Court nominees are not nominated and confirmed during a presidential election year." Ted Cruz and Marco Rubio repeated these sentiments during the Republican debate on Saturday. 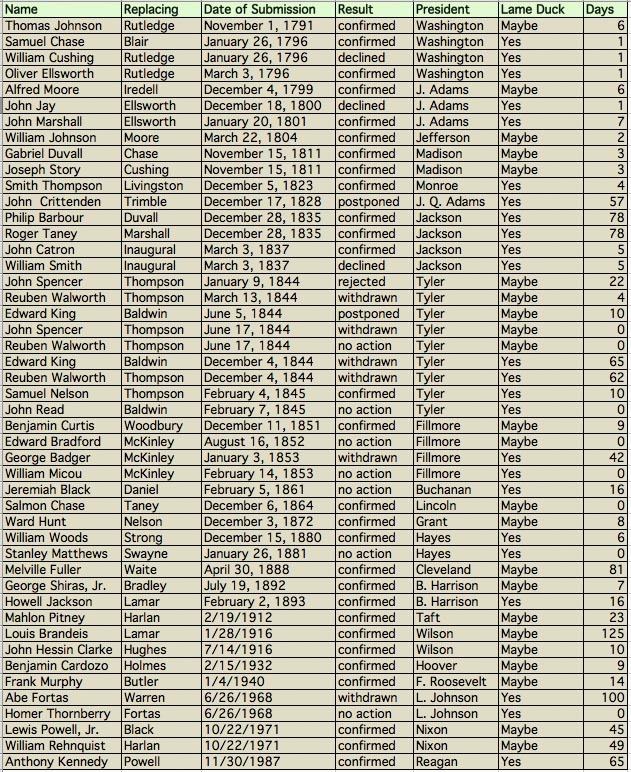 47 of the 112 justices in Supreme Court history were submitted in the last 18 months of a presidential term. Of those 47, 28 were confirmed, six were withdrawn, three declined the offer, two were rejected, and for eight no decision was made. Just over half of those 47 were placed into nomination by a president whose lame duck status was official. For official lame ducks, it is 11 confirmations, four withdrawals, three declines, one rejection, and five where no decision was made. The average length of time for a decision to be made is 37 days; the longest a nominee has languished is 261 days. There are 342 days left in Barack Obama's term. Late-term appointments were vastly more common in the 19th century than they are today. In part, this is because justices live and serve longer now, so there is less turnover. And in part it is because the Court's increased importance over time has caused more justices to strategically "time" their resignations and retirements; rarely does a seat come open in the third/fourth year of a president's term unless a justice dies unexpectedly. The upshot is that there is no "tradition" of lame duck presidents withholding their Supreme Court nominations in order to "give the voters a chance to weigh in." The Court has business to do, the President has a role in making sure that business gets conducted, and no chief executive—including Ronald Reagan—has declined to fulfill their responsibilities because their time in office was short. Grassley, Rubio, and Cruz zoomed in on "80 years," because only two vacancies have occurred in the last 18 months of a president's term during that time (one each for LBJ and Reagan). Two instances does not a "tradition" make, however, and in any event, both of those presidents made a nomination. Both John Tyler and Millard Fillmore were Democrats-turned-Whigs who assumed the presidency on the death of the incumbent (William Henry Harrison and Zachary Taylor, respectively). They weren't Whiggish enough for the Whigs and were considered apostates by the Democrats in Congress, so their nominees were punished. In fact, Tyler's failures (he only got one of six nominees approved) gave us the longest vacancy in Supreme Court history, at 27 months. Woodrow Wilson's nomination of Louis Brandeis outraged conservatives in Congress, who deemed the justice-to-be "too radical." There was also some amount of anti-Semitism driving opposition to the appointment, though it was eventually approved. LBJ's nomination of Abe Fortas to the chief justiceship (and Homer Thornberry to fill the associate seat that would have been vacated by Fortas) is the case that the GOP is currently hitching its wagon to; Cruz specifically mentioned it during the debate. In Fortas' case, Congressional Republicans were angry about the Great Society, Democrats about the Vietnam War, and both sides felt the nominee was too closely connected to the President, so they refused confirmation. Certainly, it is entirely possible for Obama's nominee to be held up for the rest of his term. More than a dozen of his appointments to lower courts have already waited for a year or more. But the President's opponents cannot rest on "custom" or "tradition" or "precedent" as their reason. Sooner or later, as the president's choice waits longer than any appointee ever has, it will be obvious that the delay is pure politics. And at that point, the question will be whether the calculus adds up for the GOP. Could Obama Make a Recess Appointment to Replace Scalia? If Obama really wants to stir the pot, he could make a recess appointment to temporarily replace Scalia until the next Senate is chosen. The Constitution gives the President the power to temporarily fill vacancies without Senate approval when the Senate is not in session. But remember, in the 18th Century, the Senate often wasn't in session and it took weeks for all the senators to reassemble in Washington, especially in the winter when their horse-drawn carriages could get stuck in the mud. In fact, even notifying the senators to reassemble was a real problem since the Morse telegraph wasn't even tested until 1837. The Senate is likely to recess later this year so members can hit the campaign trail. Suppose Obama seized the opportunity and made a recess appointment. What would happen next? Short answer: all hell would break loose. The Supreme Court recently decided a case involving the power of the President to make recess appointments: National Labor Relations Board v. Noel Canning. It was a mixed decision, with some things for the President and some for the Senate (which opposed the appointment). The Court ruled the recess power applies even for a break in the middle of a session but it also ruled that the break has to last more than 3 days. A new poll conducted for Fox 5 Atlanta, the Augusta Chronicle, and the Morris News Service by Opinion Savvy, an organization we have never heard of before, has Donald Trump with a huge lead in South Carolina. For what it is worth, here are the numbers. The Scalia Question:The debate began with a moment of silence for the deceased justice, followed by a round of questions about replacing him. The responses were predictable—he was a conservative giant who needs to be replaced by an originalist, which Barack Obama just doesn't understand. The most interesting responses came from Donald Trump, who admitted that if he was in Obama's shoes, he would certainly try to make an appointment, and Jeb Bush, who said he would not require a specific litmus test (for example, on abortion) for prospective nominees. The Ugliest Debate So Far, By Far: One might have thought that the death of one of the nation's leading conservatives would impose a certain restraint on the evening. And one would have been wrong. Whether it is because actual votes are now being cast, or desperation, or weariness with the campaign, or the South Carolina weather, nearly all of the candidates came out ready to rumble. Donald Trump was the most aggressive, attacking Ted Cruz and Jeb Bush head on, describing the former as a "nasty guy," blaming the latter's brother for the 9/11 attacks, and calling both men liars. Cruz and Bush both gave as good as they got, and Cruz had some success at causing The Donald to lose his cool. Cruz also locked horns with Rubio on several occasions, far more aggressively and nastily than in the past. Kasich waded in on occasion, also targeting Trump, though the Kasich-Trump duel was mere fireworks as compared to the dynamite being hurled in the Trump-Cruz and Trump-Bush showdowns. Only Carson stayed above the fray though, in fairness, he may have been asleep. Meanwhile, the crowd was...rowdy—not only cheering and booing loudly, but also shouting, and whistling, and catcalling. If one listened to just the audience, one might be left with the impression that they were watching a rodeo or a wrestling match, not a presidential debate. Such Jerry Springer-style theatrics (and that was indeed the program that the evening brought to mind) might be entertaining, but surely they are beneath the dignity of the presidency. Whither MarcoBot? There are two pieces of good news for Marco Rubio. The first is that he didn't perform nearly as badly as in the last debate. The second is that other stories were significant enough to push his performance down to third place on the list. However, he was still quite obviously relying on canned talking points for much of the evening. For example, "Our culture's in trouble. Wrong is considered right and right is considered wrong." Whatever that means. And when he went off script, he didn't fumble, but he did turn nasty. For example, when addressing a comment from Ted Cruz about an interview that Rubio conducted on Univision, the Florida Senator responded, "I don't know how he knows what I said on Univision because he doesn't speak Spanish." Then he called Ted Cruz a liar, which launched a 90-second shouting match between them. Rubio probably feels quite good about his performance, but he shouldn't. He looked like a small man tonight. The Real Donald Trump, Jeb Bush, and John Kasich: At least three of the six men on stage are not conservative Republicans, and on Saturday night the trio owned that fact more clearly than at any point so far. Trump, as noted, went against right-wing orthodoxy by acknowledging that he would do what Obama is doing in appointing a Scalia replacement, and in blaming George W. Bush for the 9/11 attacks (Rubio cleaned that one up later by making clear that it's Bill Clinton who is to blame). Trump also had positive things to say about Planned Parenthood. Kasich and Bush, for their parts, both embraced their inner moderates. They each lamented the anti-immigrant rhetoric of their opponents, acknowledged a willingness to work with the other side to get things done, and made a variant of the "I'm a conservative who can actually win the election" argument. Between this and the fire he showed in dueling with Trump, Bush gave the performance of the night, which makes three debates in a row where he's been at or near the top of the class. If he had discovered this version of himself six months ago, we might have a different race. Now, we will see if his rebirth came in time. Feb13 Who Will Young Black Voters Support? Feb11 Sanders a Good Thing for Hillary? Feb09 Does Bush Still Have a Shot at the Nomination? Feb09 Does the Republican Establishment Actually Want to Win? Feb07 Is There A Special Place in Hell for Women Who Don't Help Each Other?